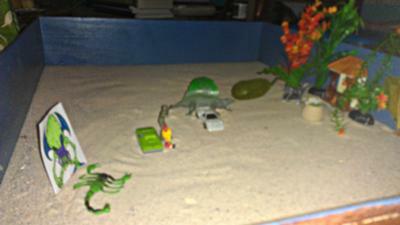 Sand Tray Therapy Dream Analysis: I have not had a nightmare that I can remember in a couple of years in fact so I did a sand tray on the last nightmare I could remember. The dream occurred while I was going through a very bad break up of a relationship. In the dream I had driven up to my house and saw my ex's current girlfriend sitting in a car in front of my house watching my sister unlock the door. The woman took out a gun and I knew that she thought that my sister was me and that she wanted to kill me. So I had to kill her to protect my sister. I took out a gun and shot her. After shooting her my ex came out of no where and checked her pulse and then hugged me as I stood disgusted and traumatized that I had just killed someone. 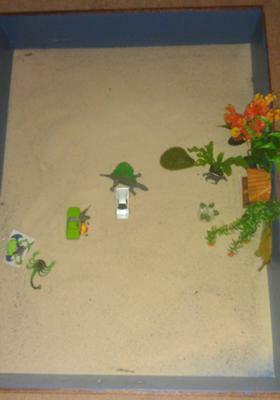 So in my sandtray I portrayed my self in two ways as a soldier with a gun being the "tough girl" and then also as a small innocent, vulnerable girl. I portrayed my sister as a young colt horse at the front of a house with beautiful plants and life. The alien and scorpion represent my ex who was incredibly selfish, really only out for himself, and would back stab someone easily. I represented my ex's current girlfriend with an aggressive dinosaur baring her teeth. 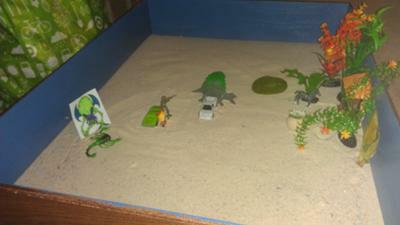 While doing the sand tray I remembered how traumatic the break up was and how much drama occurred. After looking at the miniatures I chose for myself I also remembered how strong I had to appear but how weak and helpless I felt. That also made me remember how much strength I had to conjure up for myself to be able to free myself from a horrible relationship and take care of myself.